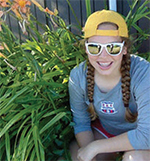 A student in the National Leadership Council (NLC) learns flexibility, trust and the beauty of quiet prayer during her Adventure Trip. My Adventure Trip consisted of “adventuring” about four days in Portland, Oregon, four days in Seattle, Washington, and five days living on two 50-foot sailboats, touring the San Juan Islands. Every day held a new challenge. The whole trip was a surprise, and we often found out what we were doing only hours or minutes before the activity began. This was difficult for many people at first, but we all realized that no matter what we did, God is still with us, unfolding His perfect plan. One of our days in Seattle was dedicated to service. We served dinner to homeless men, women and children living in Tent City 3, a temporary housing facility where the homeless may live as they work out other housing and job situations. As we served dinner, everyone was so grateful and really appreciated our help. After dinner, we talked to the residents. It was interesting to hear what each person had to say and rewarding to see the gratitude they had. I can easily say that everyone in my class grew that day, whether they became more comfortable around the homeless, excited to help those in need or grateful for what God supplies everyone. I loved the experience of visiting Tent City. Living on a sailboat was definitely an adventure for me. During the second day on the boats, we were all dropped off at Sucia Island and instructed to find our campsite for the night at Echo Bay. My friends and I searched all over for the campsite and did not find it anywhere. I was thinking about how God’s guidance and protection never stop and that we could never for an instant be separate from God. We continued walking and sang the hymn, “Feed My Sheep.” Every word was so applicable to our situation, and everyone was comforted. Instantly after we finished singing the last verse, we saw our class leader ahead of us. We walked to our campsite and were greeted with so much love from our class. It was wonderful to see how we were provided for that day and the immediate response to our prayers. 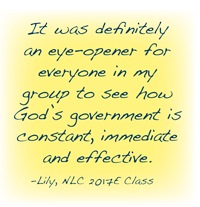 It was definitely an eye-opener for everyone in my group to see how God’s government is constant, immediate and effective. During the last night on the boats, everyone was required to do a one-hour night watch. During our shifts we were assigned not only to keep watch, but also to pray for the class. My shift was from 4:00 a.m. to 5:00 a.m., during the hour the sun was rising. I loved having the opportunity to be quiet and pray, and watching the sunrise was amazing. A truth I prayed with for the class was, again, knowing that no discord could come up. There can be only good because there is only God. 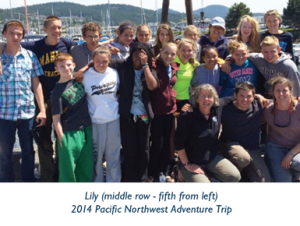 I am so grateful for the adventures I embarked on during my Adventure Trip with my NLC class. 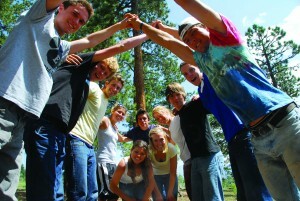 I will never forget the wonderful experiences I had and the memories I made with my classmates.